BIG has unveiled an expansive cable-car system with two transit hubs to be built in Oakland, as part of the architecture studio's plans for a new baseball stadium in the California city. 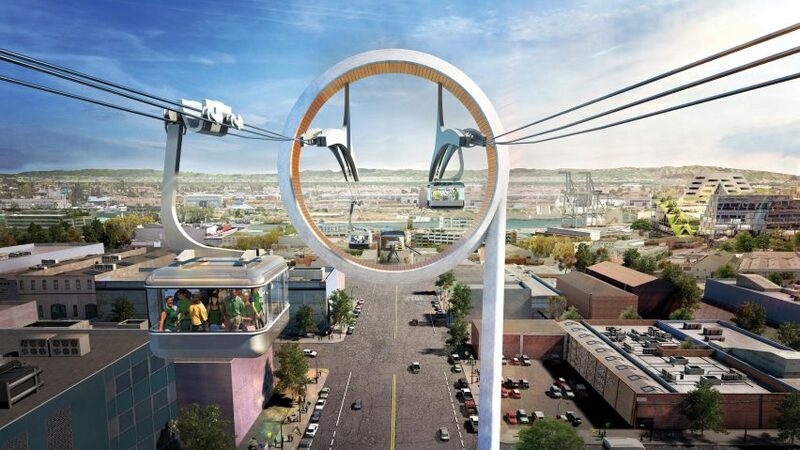 The gondola is proposed to transport sports fans from the city centre to Jack London Square – where Danish firm BIG has designed a ballpark for the Oakland Athletics Major League Baseball (MLB) team, known as the Oakland A's. The system will begin at Oakland's 12th Street BART Station, close to the Oakland Convention Center, and provide a direct route to the new stadium in the Howard Terminal area. The gondola is intended as a faster and easier transport solution for the city's new ballpark. Oakland suffers from vehicular congestion, similar to most cities in the US, so the system could help to alleviate road traffic on match days. Although the cable cars are proposed for use during stadium events, they could also transport people at any time to lessen traffic. The system would also be electrically powered, to help boost the city's green credentials. "A gondola provides a unique and important transportation solution for better connecting Oakland's growing downtown and waterfront," said Jeff Bellisario, vice president of the Bay Area Council Economic Institute.